There are a couple false tornado myths that have pervaded society for a long time, though they've thankfully waned a bit in recent years. The first is that tornadoes fall apart when going over mountains. That is false of course. In 1987, an F-4 tornado crossed the Continental Divide near Yellowstone National Park. More recently, this past July, Mt. Evans, Colorado recorded a tornado that was captured on video as well. The other most pervasive tornado myth is that "they don't hit cities." And to answer simply: That myth basically developed out of dumb luck. Since the vast majority of the country is not urbanized and tornadoes are extremely small relative to that land area, the odds favor cities not getting hit. But by no means does it mean they cannot get hit, and we've seen many instances of tornadoes striking major metropolitan areas, and even some large central business districts as well. Let's talk about some examples. Obviously, the most recent example (and inspiration for this topic) occurred just this past weekend with two tornadoes striking. But the city to the north has been hit several other times as well. Using the Storm Events Database from NCDC (a worthwhile MS Access 1.1 GB download I might add) New York County (Manhattan) recorded an EF-0 tornado in 1995. Brooklyn was hit in 2007 and 2010, the latter of which caused over $8 million in damage. Queens has been hit 3 times since 1985. Staten Island has been hit 4 times since 1990, and the Bronx has recorded one twister. 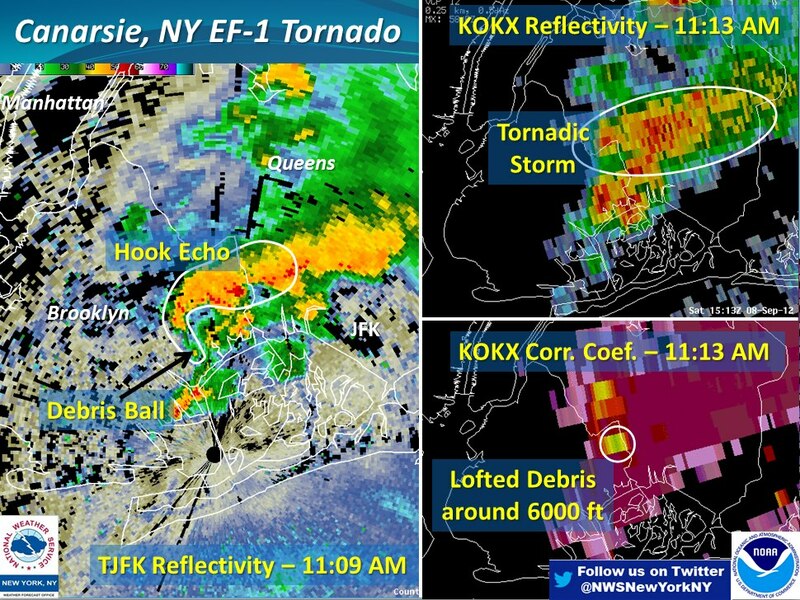 I believe this past weekend's tornadoes will be the 12th and 13th to strike NYC in the modern (post-1950) era. You may say that's a lot of tornadoes for one city, but NYC covers a very large area and there's always someone nearby to see what's going on, given it's the largest city in America. So how about Philadelphia? Philly has confirmed 10 tornadoes since 1958 within city limits, the most recent on May 18th of last year. One of the more recent ones was also the strongest, an EF-2 in 1998, which caused extensive damage to multiple buildings at the unoccupied Byberry Industrial Park. DC has only recorded one tornado within the limits of the city, according to the database since 1950. It, however, occurred on September 24, 2001, part of an outbreak that caused an F-3 tornado to strike the University of Maryland and spawned an F-4 in rural Northern Virginia. Nashville, TN in 1998, an F2 went right through the downtown of the city. Miami, FL in 1997 was struck near Downtown by an F-1 tornado, which was at the time, one of the most dramatic photos of a tornado striking a major city. Atlanta in 2008 was one of the most memorable recent major city strikes, as it occurred during the SEC Championship at the Georgia Dome and damaged several buildings in the middle of Downtown ATL. It was rated an EF-2. Downtown Fort Worth, TX in 2000 was struck by an F-3 that caused half a billion dollars in damage. And they happen out west too. Downtown Salt Lake City was thrashed in 1999 by an F-2 tornado. And then there's one of the least documented (given the scenario) of an F-2 tornado that ripped right through the southern part of Downtown Los Angeles, CA. The twister injured 30 and caused damage to the convention center. Somehow this is miraculous, given that it struck near busy freeways right at rush hour. It remains puzzling to me that more documentation on this one does not exist. Anyway, the bottom line in all of this is that cities being struck by tornadoes happens quite frequently, and it will continue to occur through time, and unfortunately a lot of large cities are at risk of one day being impacted.